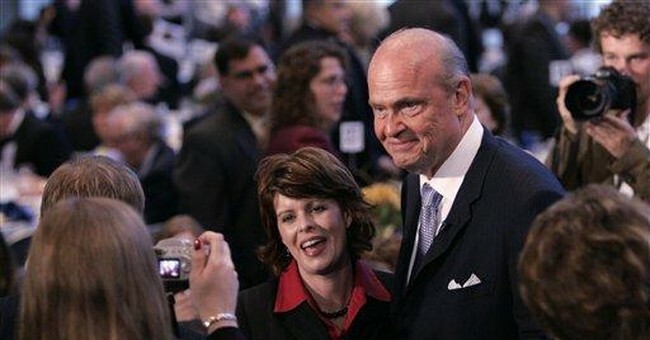 Fred Thompson has not officially entered the race for President of the United States, yet already he is being assailed by Republican bluebloods who want preferential treatment in America's civil justice system. Thompson's crime? He was once a (gasp!) trial lawyer who supports equal justice for all. The "bluebloods" are Republican business elites who invest in candidates as a cost of doing business, expecting to get a return on their investment if they pick winning candidates. Usually that "return" comes in the form of tax breaks, financial subsidies, or limited accountability for wrong doing. Bluebloods advocate imposing "caps" or artificial limits on the amounts that victims can recover for damages suffered at the hands of wrongdoers who engage in negligent or reckless conduct. While there is no way to limit the extent of the harm that a wrongdoer may inflict, bluebloods want to limit the amount wrongdoers would be required to pay for the damage they cause. They prefer "caps" rather than being required to pay awards commensurate with the damages actually suffered. And, rather than letting individual states address these issues within their own borders, they want the federal government to impose a "one-size fits all" approach to dealing with such issues. In other words, they want federal bureaucrats in Washington, acting at the behest of special interest lobbyists, to decide the upper limits of what innocent victims can recover without regard to the evidence in any particular case and regardless of what a local jury thinks is just and fair under the circumstances. Bluebloods use the euphemism tort "reform" to conceal the true nature of their agenda. A more accurate description of what they are seeking is tort "deform." The term "tort" means a private or civil wrong, with the added implication that the wrongdoer is required to compensate an innocent party for damages suffered as a result of the wrongdoing. Derived from the medieval Latin word tortum ("wrong"), the root of the word goes back to the ancient Latin verb torquere, which means to twist (compare our modern use of the word "torque"). At its root, therefore, the word "tort" denotes something that is twisted, and needs to be put straight. Bluebloods maintain that conservatives should support their efforts to twist the civil justice system in their favor. In truth, their proposals represent little more than affirmative action programs for wrongdoers. Historically, tort laws have been matters for decision by the states. Not all states deal with such matters in the same way, and problems that exist in some states may not be present in others. What is a problem in New York may not be a problem in New Mexico, and the approaches to problem solving may be different in Tallahassee than in Topeka. Conservatives have traditionally respected the rights of the states to identify and address their own problems. They have typically opposed one-size fits all solutions dictated by Congress, believing that people who have their feet on the ground in their communities are in a better position to deal with their problems than bureaucrats who are far from the scene in Washington, DC. Nevertheless, bluebloods, who have historically objected to the federal regulation of their businesses, now want to impose draconian federal requirements on the victims of their wrongdoing. Such attempts should be eschewed by conservatives who believe in the principles of "federalism" and "states rights". True conservatives understand that accountability and responsibility run hand in hand. Human nature is such that if wrongdoers are not held fully accountable for their wrongful acts, their wrongdoing will increase. As Ronald Reagan said, "If you subsidize something you get more of it"; nevertheless, subsidized wrongdoing is exactly what Republican bluebloods seek. While limitations on liability will likely increase the profitability of businesses engaging in wrongful conduct, such increases will come at the expense of those who are injured by such conduct. Conservatives should not embrace an agenda that relieves wrongdoers of the consequences of their wrongdoing. Affirmative action for wrongdoers can hardly be described as a conservative approach to problem solving. Furthermore, Americans have historically rejected the idea of a "privileged class" that is allowed to operate under a different set of rules from everyone else. "Equality under the law" is a proud American tradition. Most Americans understand that when they act irresponsibly and put fellow citizens in harm's way, they will be held accountable for their conduct. There should be no exceptions for the rich and powerful. Rich or poor, big or small—accountability for the consequences of one's actions should be the norm for all members of a just society.